Welcome to the second Virtual Vegan Potluck! If you just happened to come to my site and don’t already know about the Virtual Vegan Potluck, here’s how it works. Since we can’t all get together for a real vegan potluck (participating bloggers are from all over the world! ), Annie from the blog An Unrefined Vegan came up with the idea to have one virtually. This means that a lot of different blogs post vegan recipes on the same day for a variety of courses…appetizers, salads, main dishes, soups, desserts, etc. You can work your way through the whole potluck by starting at Vegan Bloggers Unite! and following the links. The blog before mine in the potluck is 40 Fit In The Mitt. The blog after mine in the potluck is VegHotPot. My plans for the potluck were a bit thrown off by Hurricane Sandy. I signed up to make an appetizer, but I wasn’t able to make the recipe I wanted to this past weekend because Hurricane Sandy kept me from the grocery store. I didn’t have the ingredients I needed, so instead, I’m sharing a different recipe, which is also quite tasty. It could still fall under the appetizer category, or it could be a side or a main dish too. It’s got a yummy flavor combo, and it’s quick to make. This recipe originally came from Vegetarian Times in the April/May 2011 edition. I changed a couple small things, but it’s mostly the same as the Vegetarian Times Recipe. Chop the onion and shallots, and press or mince the garlic. Roughly chop the cilantro. It’s okay to leave some of the upper stems in with the leaves when you chop it. Set aside 1/4 cup of the cilantro for garnish. Add in the coconut milk, broth, and brown sugar. Stir and bring to a simmer. Reduce the heat to medium and cook for 5 minutes. Drain the tofu and cut it into 1 inch cubes. If you want it to be a little crispy on the edges, you can saute it in a little oil in a separate pan before adding it to the pot. Add the tofu to the pot with the other ingredients, and simmer another 10 minutes. In a separate pot, cook the noodles according to the directions on the package. You could also substitute rice instead of noodles, if you prefer. Add the broccoli florets to pot of noodles for the last 2 minutes of cooking time. Drain the noodles and broccoli and add them to tofu-curry mixture. Mix well, so the noodles and broccoli are coated. 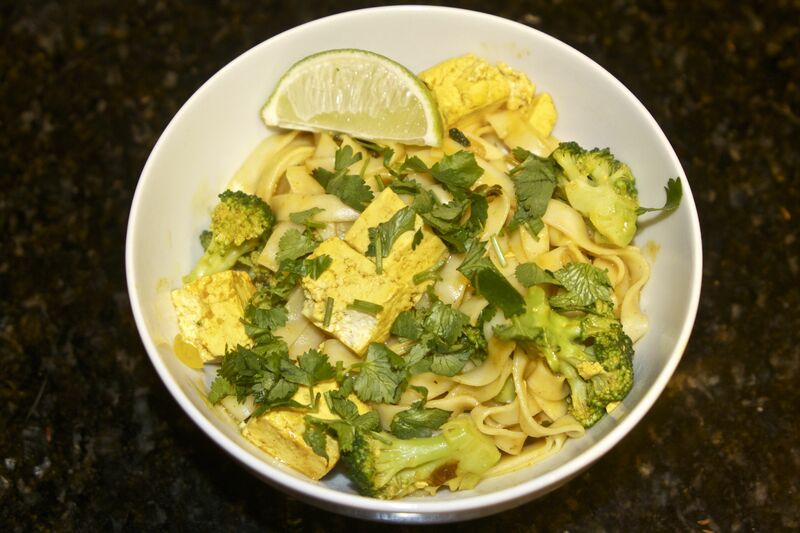 Serve the curry noodles with the chopped cilantro sprinkled on top and a lime wedge on the side. Don’t skip the lime! Squeezing the lime juice over the noodles really completes the flavor of this dish. This entry was posted in Food Blogs, Recipes, Vegan Blogs and tagged broccoli, curry, lime, noodles, potluck, Thai, tofu, vegan, vegan Thai food, Vegetarian Times, virtual vegan potluck. Bookmark the permalink. Awesome dish! I totally want to dig in!!! This is the recipe that made me buy the magazine in the first place. Definitely worth a try and not too hard to make! I love it when you can get inspiration from a magazine like that. Hope all is well and that you have power again. This recipe looks so good! I’m loving all the flavors you used, especially the coconut milk. I love it in savory things! A tasty creation that i love to make soon! 🙂 MMMM! I also participated & loved doing that! It was such fun too! Looks delish! I love how bright it is. Yum! Looks incredibly satisfying! Thanks for joining the Potluck, my dear! Glad you made it through the hurricane safely. And a wonderful dish to boot. Can’t wait to try it. Thanks for stopping by! Hope you fared okay too if you were in the path of the hurricane! This looks very lovely! I hope you weren’t too badly affected by the hurricane! We were lucky and made it through without any big issues, hope the same for you! Noodles are my weakness. This dish looks amazing! Me too 🙂 Looking forward to making it again! Great blog title and I love that Kafka quote. I am making something tofu broccolish tonight too, your dish looks great. How are you fairing after the hurricane? Thanks! I’m doing well after the hurricane, hope you are too if you were in it’s path! Glad to have found your blog. Looks like an amazing dish! Thanks for stopping by! Hope you enjoy it if you make it! This sounds so good! I love noodle curries. Hope you & your loved ones have weathered the storm ok. Take care. Nice flavors 🙂 Gotta love anything vegan with coconut milk and noodles! Definitely 🙂 The lime adds a lot too! Wow! That looks so delicous. Yum.. looks perfect for a quick weeknight meal! Such awesome flavors – can’t wait to try it out! Thanks for the post! I’m pretty much of fan of noodles any-which-way. Yum!